In today's May 15, 2010 newsletter . 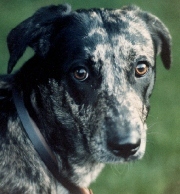 . .
Steve probably was a Labrador/Catahoula cross-breed. She had been the only puppy in a litter that did not find a home. My daughter Jennifer spotted her and took her, just as her owner was about to take her to the Humane Society. She was a great puppy, but as she matured she displayed soreness in her hips. It turned out that she had serious hip dysplasia. One veterinarian said “she will never be normal” and to consider euthanasia. We saw another doctor who explained a surgical procedure (an orthopedic specialist would be required) but suggested first reducing her weight by five pounds and giving an anti-inflammatory pill whenever soreness was apparent. Then let's see how it goes. Steve never required the surgery, and she lived just two month’s shy of 14 good years. The two of us hiked and backpacked in the mountains of the western United States and a few in Canada. Once in while she would stiffen up after too much activity and I would give her the medication. The next day she would be fine. Lesson learned: Often just attaining and keeping normal body weight works wonders in reducing joint pain, and other problems as well. Conversely, lugging around extra weight puts stress on joints and leads to problems and pain. Dogs or people, it’s the same either way. There can be other reasons for joint pain, of course. But so often it is from being overweight or beating yourself up with too much repetitive exercise of the wrong kind. Think of it this way: Even if it turns out that surgery is needed, normal bodyweight and proper exercise habits never hurt anyone. It always helps. One of the popular stops at my website is Muscle Stories and Fitness Interviews. They're fun to read and there are discoveries to be found. 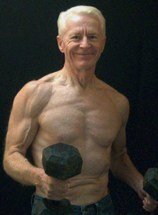 The subjects are interesting people, from living legends like Jack LaLanne to a young lady called Skwigg, and her quest for high-level fitness -- without obsessing about it. She's funny, and wise. The names are in alphabetical order. Jump in anywhere. I think you'll enjoy them. Muscle Stories and Fitness Interviews. Expand your push-ups horizon. Sure, standard, plain vanilla push-ups are good for us. But there's a wide, wonderful world of push-up varieties waiting to be tried. Here's one example: Discover weighted push-ups. Like newspapers, magazines and television, the newsletter and web site contain advertising and some affiliate marketing links. I receive a commission when people buy the advertised products or services. The newsletter and web site provide information to help users establish and maintain a fitness lifestyle. But fitness information is not the same as fitness advice, which is the application of exercise and dietary practices to an individual's specific circumstances. Therefore, always consult with your physician for assurance that fitness information, and your interpretation of it, is appropriate for you. Your comments or questions are always appreciated.